Students in business attire filed into the RWL gymnasium, ready to listen to local professionals. 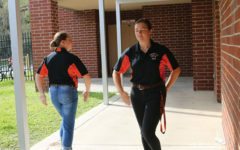 Oviedo High School’s first annual Career Day kicked off at 9:15 a.m. on Feb. 8. The new event was created to fulfill a curriculum requirement. 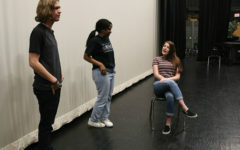 “It was a replacement for the senior project for the standard-level students, so we are using a career portion to help meet the standards for the class,” said English IV honors teacher Kati Hansen. The career day also intended to help guide students’ future career goals. 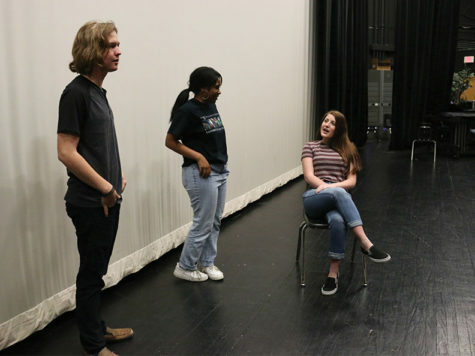 “We wanted to expose the students to different types of careers they may not have thought about, in order to open and broaden their minds for future career planning,” Hansen said. 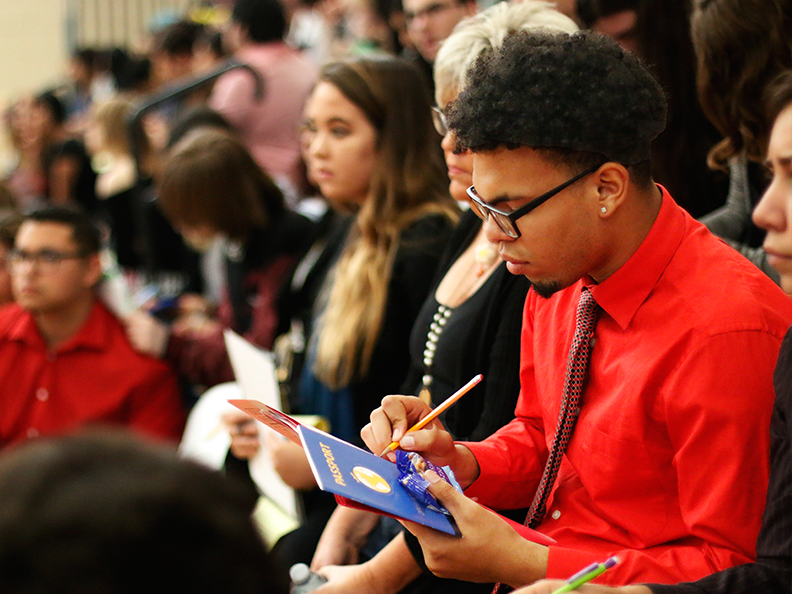 Senior Victor Castro takes notes during the Career Day event on Feb. 8 at the RWL gym. English IV teacher Kim Finnegan also hoped to inspire students to look into other career paths. The English teachers reached out to members of the community and asked them to come speak, according to Hansen. Students also took part in classroom activities to help prepare them for the event. Some students, however, wanted to do more preparation prior to the event. Senior Bryana Boucci decided to research careers beforehand in hopes that it would help to guide to the information she wanted. “I found things that I thought were interesting, I was like, ‘OK, I hope that those are there,’ and if they weren’t, then I looked around and saw if there was anything that I liked,” Boucci said. Senior Derek Lopez prepared mentally for the event. Optical engineer Rodney Jackson learned about the event from his wife, who is an alumna of Oviedo High School. Speaker Chris Flymier, who works at Sea World, got involved to inform students about interesting career options and how to get started in them. 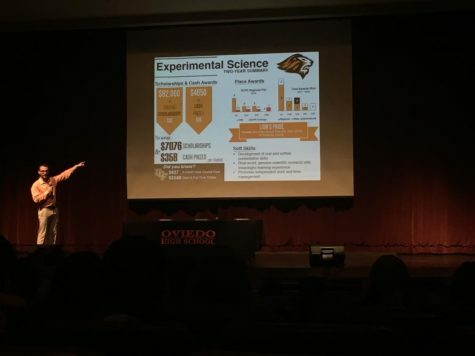 Similar to Flymier, speaker Annalisa Gollob, a civil engineer for the City of Oviedo, was motivated to attend because there is currently a shortage of engineers. 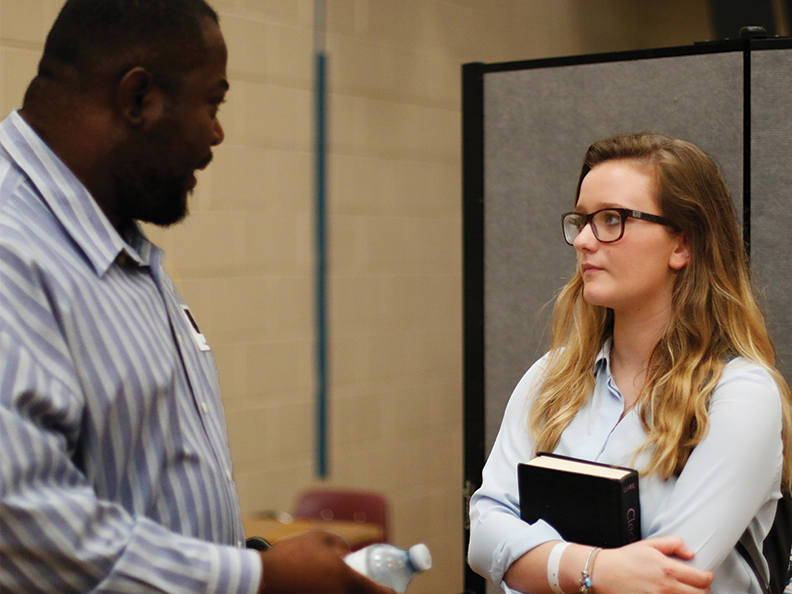 Optical engineer Rodney Jackson talks to senior Anna Wampler after the official presentations at the Career Day event on Feb. 8 at the RWL gym. Jackson saw his role as motivational, as well. Though her planned major in cosmetology wasn’t represented, Boucci still learned useful information. “I got a better insight on different genres of work that I found interesting and that I could go into,” Boucci said. According to Lopez, the event taught about the difficulties of getting into his desired career in sports management. “I learned how much sacrifice it takes to prepare yourself for something that you want to succeed in,” Lopez said. Flymier stated that the event was executed well. Lopez, however, stated that he wished he had had more information about the speakers beforehand. Other students wanted more time with speakers. Hansen stated that she wished that there were more careers represented. “I would’ve liked more military personnel, more creative careers–arts, music, producing,” Hansen said. According to Finnegan, the overall event was a success. 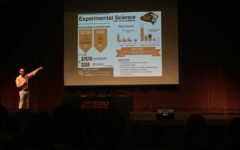 “Students made contacts, they made connections, they got business cards, they found out something that they didn’t know before about a career that they were interested in,” Finnegan said.